Watreon is on the brink of war. A fact that has eluded Ryhan until days before her sixteenth birthday. Drought has crippled her village and made it nearly impossible to live in. Angry and confused by what their king’s lust for power has done to their land, her family is forced to leave the only home she has ever known. Packed and ready to venture into the unknown, everything changes the night before they are set to leave. Ryhan discovers a secret that her mother has been hiding from her. 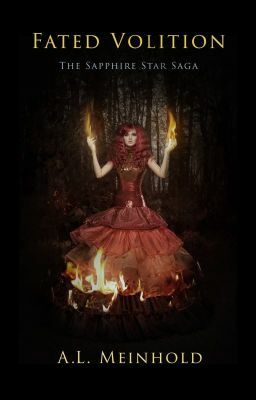 Not only was she one of five girls born under a shooting sapphire star, but she possesses the elemental power of fire and is part of a prophecy about the coming war. Setting out to find the other daughters she leaves her mother and father for a journey she never expected. Along the way she faces the challenge of learning and controlling her powers, experiences love and heartbreak, and struggles to accept the life she is destined for. All the while testing the peace keeping limits of Evangeline, whose elemental power of spirit is used to bridge their powers and keep the five of them connected. Together they cross an ocean to seek out Alexandra, Lillian and Victoria. Battling evil forces at every turn, they race to meet with the magical council to start training. Each girl wrestles with the reality unfolding before them and the choices they will all be forced to make. Overwhelmed with expectations, they hope that their powers of earth, air, fire, water and spirit are enough to defeat their enemies and save not only themselves but all of Watreon.